1. Finely grate the grapefruit zest into a large bowl then remove the peel and segment the fruit over the bowl to catch the juice (squeeze all the excess pith to extract as much juice as possible). Stir through the coriander stalks, olive oil and sugar then season. 2. 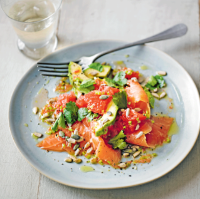 When ready to serve, toss the avocado, salmon and most of the coriander leaves through the dressing. Serve immediately on a platter or individual plates, scattering over the mixed seeds and reserved coriander leaves.